Happy 4th of July to you in the USA! In our new neighborhood there have been firecrackers and fire works lite off all week. The next door neighbors said they will be having a fireworks party so the sky will be bright and sparkly tonight! This week with my family here has been so joyful and I actually found some time to craft and I wanted to share a canvas that I made for fun. When Trimcraft announced the Mirabelle Collection I ordered as much as I could from 7 Kids College Fund Store. 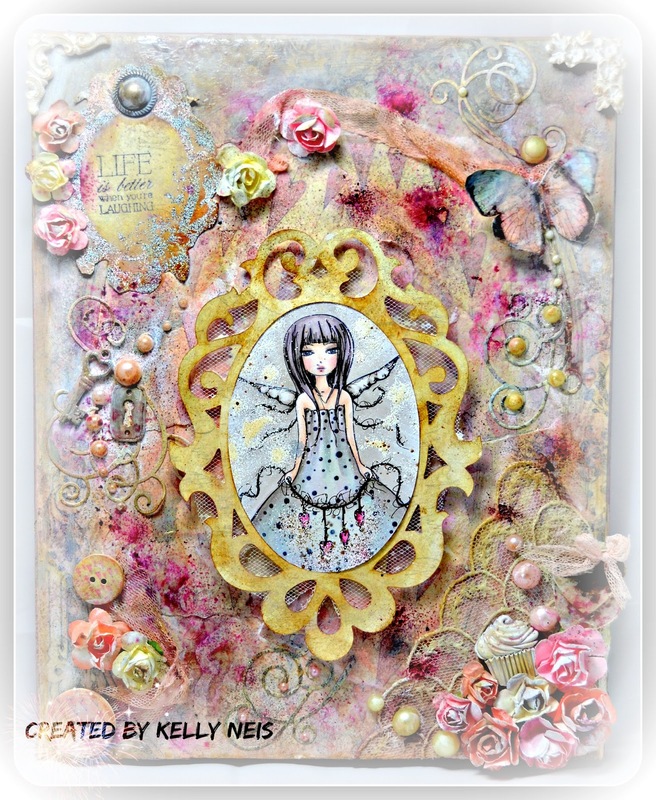 It finally came into the USA as I was moving so I decided to use my Butterfly Santoro stamp and accessories to create this canvas. I colored Butterfly in Copic Markers and added Frantage. Then she is mounted on Tulle and then onto the Sizzix Frame with pop up tape to make a floating frame. I used all the flowers that came with Butterfly and added the matching pearls also. This corner I could not resist using a piece of old lace from the family as a background. 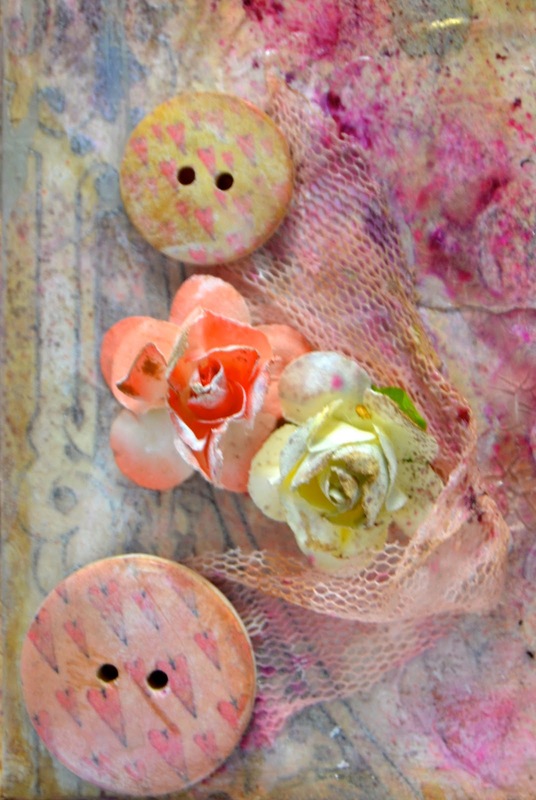 Here are 2 buttons from the collection that resemble the paper I used in the background. 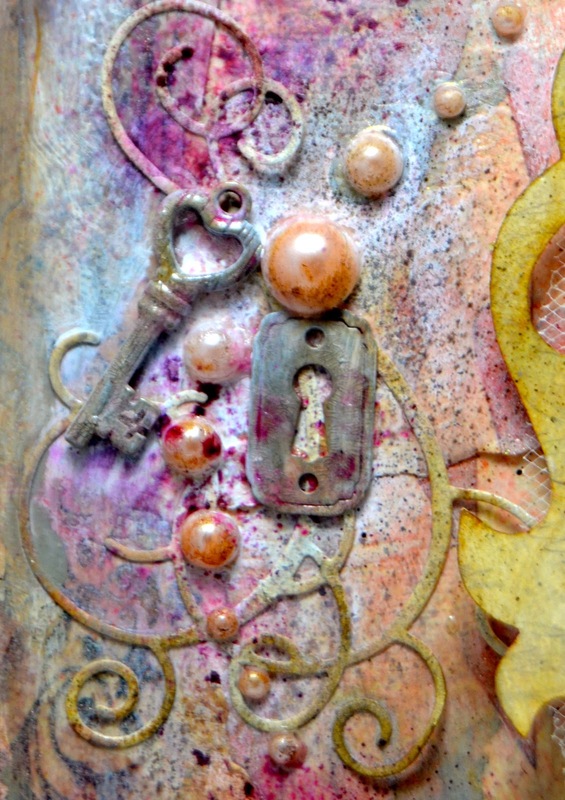 I used Tim Holtz distressed paints to cover the background and then used the air brush for his distressed markers to spritz dots of marker all around. Here is a stamp and frame from Kaisercraft that I inked and Frantaged before cutting out. Part of it is modge podged on but some is left loose. I had a scrap of paper with this butterfly on it so I cut it out, distressed it a bit and then applied TH crackle paint onto it. The pearls are from the Mirabelle collection. Here is what we have been up to lately. A double rainbow appeared across the road after a summer rain. Noah, Isaac and Ben are playing basketball in the park, of course they are not following the rules. It has bee a lot of goofing off, laughing and chaos with all of us this week. My husband has been working hard on installing things we need like a invisible fence system for the dogs, shelving for storage, fixing our septic system, yuck! I have been cooking a lot and buying groceries every other day for these hungry boys. In a few days they will head back to MN to work and 3 of us will be here and it will be very quiet. Yes lonely but I will have to craft more as my back allows me to. Wow.....what a spectacular creation, Kelly! I've never heard of those stamps, but I sure loooove this image...will have to check it out!!!!! Lots of goodies on this canvas! Lots of good times at the Neis house!!!! Kelly I LOVE this! 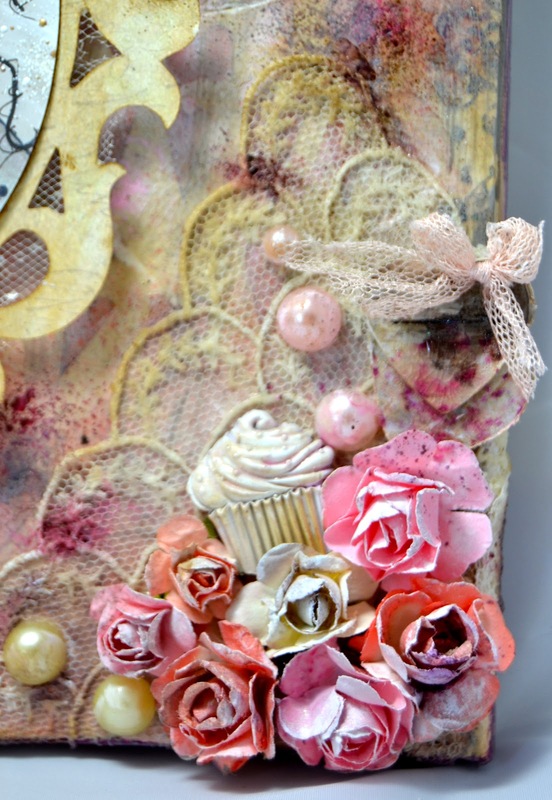 The image in the centre and all that yummy layers of texture in the background are so intriquing! Great job! Glad you are settling in to your new home and enjoying visits from family! Stunning canvas! So many gorgeous colours and beautiful embellishments! 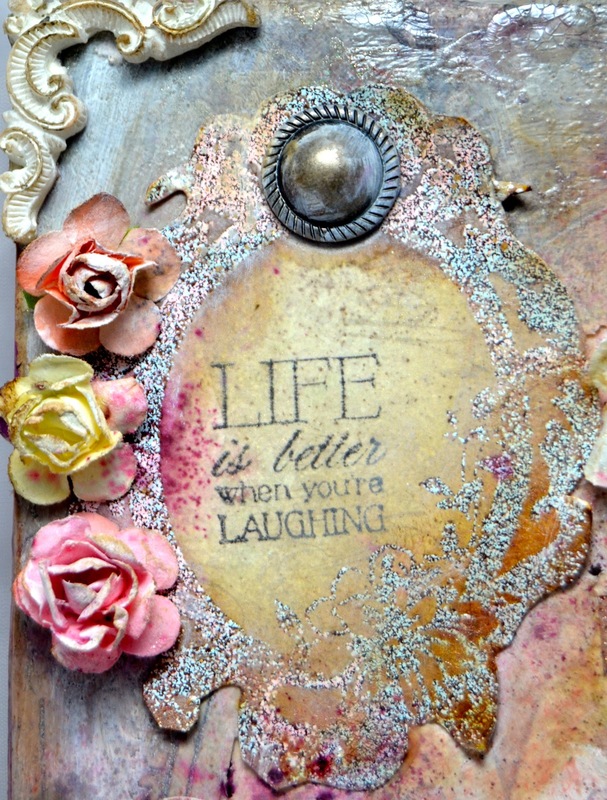 Great sentiment and love the way you used your frantage! Kelly this is totally awesome and the colors are outstanding. It's so good to see you back crafting. Looks like you're getting settled in you new home and it sure is beautiful. Gorgeous pictures too. Your sons seem to be enjoying the new property too. Have a fun and safe holiday! Wow, what a great canvas to get back to crafting with, it is absolutely gorgeous. 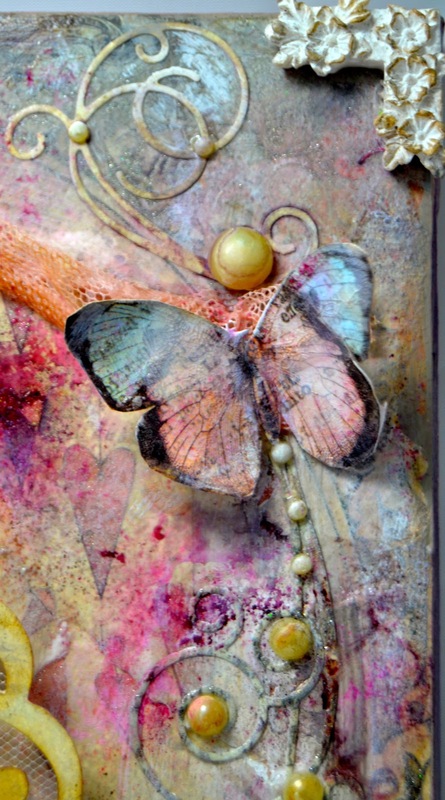 I love the central image, she is beautiful and you have surrounded her with some wonderful embellishments - love the gorgeous butterfly in particular. OMG ! love the colors you used ! so fab canvas, lovely details ! Fantastic ! Lovely shots of your family ! 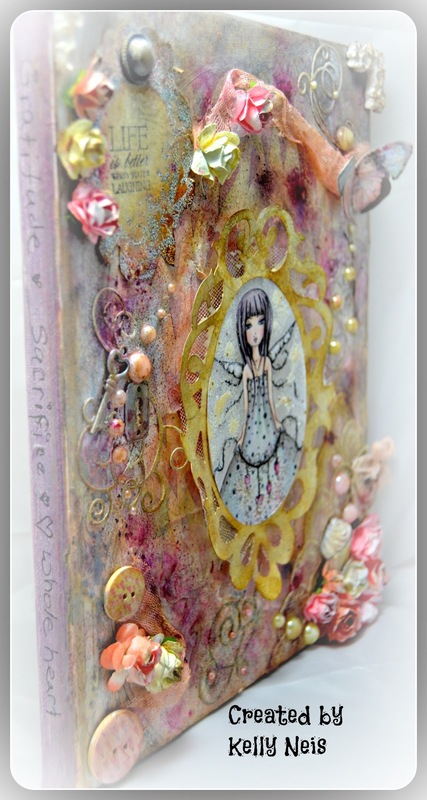 What a fabulous mixed media creation - love all those layers and that fab spatter. The shimmer from the glitter and the butterfly are gorgeous! Glad you've been having a great time with everyone there - you will miss them, but what a lot you got done too. Gorgeous canvas! Beautiful colors and design..... Miss you!! !